If you're just starting out with freelance writing, you may find yourself feeling a little overwhelmed. There's so much to consider when it comes to freelancing, especially what type (or types) of work you want to do. You will also be trying to build your writing portfolio. 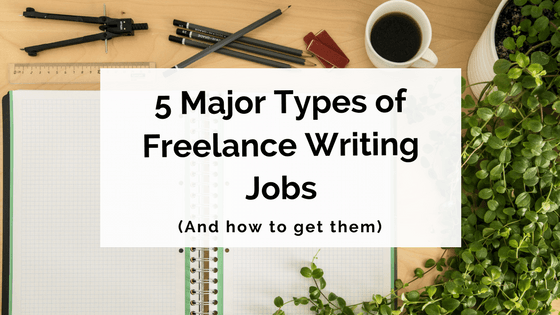 There are many different types of freelance writing jobs available these days. Everything from a traditional magazine article to an email newsletter to a Facebook post is fair game for a freelance writer seeking work. To help you get started, we've put together a guide to the most common types of freelance writing jobs – complete with tips on how to get them! This is perhaps the most common type of writing that comes to mind when people think about freelancing. Many freelancers work on an individual article basis, whether for print or online mediums or a combination of the two. As an article or feature writer, you're able to write about things that interest you, things you're an expert on, things you're passionate about. You're able to chase the stories you want to write and carve yourself a niche, if you so desire. However, if you're considering going down this road, you will most likely need to diversify your income stream to supplement the money you make from article and feature writing. When you have a variety of different revenue streams available, you can put together a portfolio of jobs – some will inspire you more than others. Some will pay more handsomely than others." Be aware that freelance article or feature writing work won't magically come to you. More on that below, but first, let's take a look at what's involved in the two main types of article and feature writing. This is perhaps the most traditional type of freelance writing: contributing articles to print publications like magazines or newspapers. If you're wondering whether this is still a viable freelance path in the digital age – we can assure you it is! Don't be put off by the myth that print journalism is dying. While of course it isn't as widespread as it once was, there is definitely still a place for freelance writers in the world of print publications. However, as we discussed above, it's a good idea to diversify and expand your income stream to ensure you can make a living as a freelance writer. Don't rely on magazine and newspaper work alone, at least at first, or you may find yourself disheartened and desperate for work. So what exactly is involved in being a freelance writer for a magazine or newspaper? Many of these types of magazines rely on pieces contributed by freelance writers. Articles need to be well-researched and written to a specific brief; if you're writing for a trade magazine, obviously you will need to be extremely well-versed in that particular industry or topic. Newspapers, on the other hand, are less likely to take on freelance writers for general news stories. However, many newspapers have columns or supplementary sections, such as an entertainment or lifestyle liftout, which will often contain pieces from freelance writers. The majority of magazines, journals and news outlets have an online presence these days, where they'll publish content in addition to their print counterparts. There are also countless 'online magazine'-style websites existing entirely online, which publish articles, features and news pieces. For many freelance writers, writing pieces for websites is a more viable and lucrative option than concentrating solely on print magazines or newspapers. There are thousands upon thousands of websites out there, covering every topic and type of audience, and this makes it a little easier to find freelance writing work online. How do I get this type of writing job? There are generally two ways you can write articles for magazines, newspapers or websites: by commission, or by pitching directly to editors. More experienced writers may receive commissions for articles, but most freelance writers need to pitch to find work. As we said above, don't expect this type of work to come to you – you need to get out there and actively seek it! Stay tuned on Writer's Edit for more advice about how to pitch to editors of magazines, newspapers and websites. In business nowadays, content marketing is king. And luckily for freelancers, this has meant a surge in demand for services such as copywriting and content writing. As a freelance copywriter or content writer, you'll write for businesses to help establish and promote their brand, engage consumers and clients, and market products and services. Content writers create text that informs or entertains an audience with engaging copy. For companies selling a service, a content writer's job is to build reputation and authority whilst instilling trust. For websites and publications not selling a service, a content writer's goal is to entertain. The aim of a copywriter is to persuade audience members to take a specific action. Most often that action is to purchase a product or service." Getting content and copywriting jobs doesn't involve the same sort of process that article writing does. You won't really be pitching ideas to businesses; you're more likely to be applying for jobs advertised online. You can also reach out to businesses with an offer of your services, but don't rely solely on this cold-calling approach to secure a steady stream of work. Content agencies are also a place you can start with this type of writing. Agencies will hire freelancers to complete content assignments for their clients (but beware the possibility of being underpaid or exploited – ensure you're only working with reputable agencies). As with any freelancing service, word-of-mouth will also serve you well here. Be sure to network wherever possible and maintain a solid online presence so that people can find you and your services. Blogging can be considered a sub-category of content writing, when you're creating blog posts for businesses as part of a content marketing strategy. However, it can also be a standalone freelance activity. The type of blogging we're talking about here is an individual blog and/or a guest blogging strategy through which a freelancer makes money. Once you have established your own blog and grown a community of readers, there are a number of ways you can monetise your blog, as well as writing posts for other websites (and getting paid for it!). Guest blogging is a key component in this type of job, and paired with your other income streams, it can be a great way to make money as a freelance writer. To be a successful freelance blogger, you really need to establish your particular niche – your point of difference from the countless other bloggers out there. If you specialise in writing about a particular topic, it's much easier to establish yourself as a successful freelance blogger. Creating valuable content that reaches a specific audience of readers is the best way to ensure your blog will be successful. Once your own blog is established, you can pitch to other blogs or websites as a guest or regular blogger. You may even be approached via your own blog. We are living in the age of social media. Every business has (or should have) a social media presence these days, and as a freelance writer, you can really capitalise on this! While a lot of businesses manage their social media presence in-house, many choose to outsource their content creation to freelancers. Planning, writing and scheduling social media posts across a variety of platforms can be a tricky and time-consuming job – one that's perfect for freelance writers. To really succeed in picking up freelance social media jobs, you'll need to be a bit of an all-rounder. It's not just writing that's involved. Social media is largely a visual medium, so there'll likely be some design aspects attached to a social media gig as well – think images and videos as well as written content. You'll also need to have an understanding of how various social media platforms work, and how audiences respond to and interact with social content. To find social media jobs, again, we recommend searching online job boards, as well as reaching out to local businesses who may require social media management. It's also a good idea to specifically advertise and promote the fact that social media content creation is part of your freelance repertoire. This way, people know for sure that they can approach you for these kinds of jobs. We know – this isn't technically a type of freelance writing job! But if you're a writer, there may be a good chance you're interested in editing as well. Freelance editors and proofreaders provide services to all manner of clients, from businesses who want their content checked to individuals seeking an editor for their book. If you're dedicated enough, you can combine freelance editing with freelance writing as a way to diversify and extend your income stream. How do I get this type of job? First of all, we strongly recommend undertaking the right training before trying to find freelance editing jobs. Just because you're a writer doesn't mean you automatically know what you're doing when it comes to editing! If you're serious about branching out into editing, you need to do the right groundwork first. If you haven't already done so, take a course that covers the ins-and-outs of all the different types of editing. Not only will you need this in order to be a successful editor, but clients will have more confidence in your abilities if they know you've undertaken specific education and training in editing. From there, it's basically a matter of putting yourself out there online to find freelance editing jobs. But there are a few other things you should do first! Check out our tips on how to get started as a freelance editor for more guidance. For those just starting out as freelance writers, we hope this post has been helpful in getting you on your way. For those who have already established freelance careers, we'd love to hear about your freelancing experiences in the comments! Which type of freelance writing do you get the most work from?